This age-defying, oil-free serum is uniquely formulated to reduce the appearance of expression lines on the face. Apply to clean skin prior to moisturizer. Dispense one pump and gently dab on expression lines around eyes, forehead and mouth. Avoid direct eye contact. Can also be used on neck. Wait one minute before applying moisturizer. Use twice daily, morning and evening, for best results. • Palmitoyl Hexapeptide-19, Acetyl Hexapeptide-8, Acetyl Octapeptide-3 & Dipeptide Diaminobutyroyl Benzylamide Diacetate. Help to reduce the appearance of expression lines. • Palmitoyl Tripeptide-28 & Trifluoroacetyl Tripeptide-2. Provide skin smoothing and toning benefits. • Palmitoyl Tetrapeptide-7. Helps skin appear more firm. • GABA – Gamma-Aminobutyric Acid. Helps to reduce the appearance of expression lines. What does the “7” in Revox™ 7 mean? The number “7” represents the seven peptides that soften the appearance of seven types of expression lines. I feel a slight tingling sensation when I apply Revox™ 7. Is that normal? A slight tingling felt by some upon application is normal. If I don’t feel a tingling sensation, does that mean the product isn’t working? No. Some individuals may not feel any tingling as it is very slight and dissipates quickly. I have lines around my eyes. Will this product help? Yes. 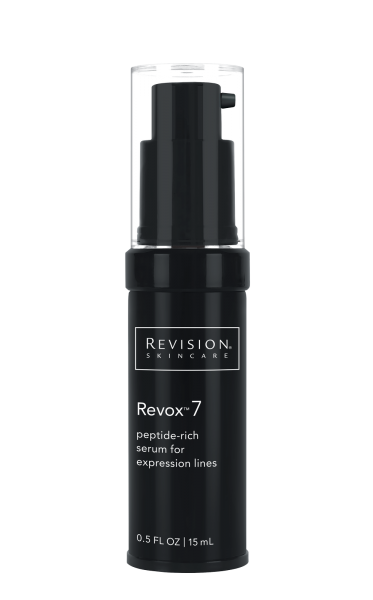 Revox™ 7 is designed to be used on all areas of the face and neck and will improve the look of fine lines and wrinkles. How is Revox™ 7 different from Revox™ II? Revox™ 7 contains the newest peptide technology, including two award-winning peptides. The new peptides found in Revox™ 7 are present at high levels and include Palmitoyl Tripeptide-28, Trifluoroacetyl Tripeptide-2 and Palmitoyl Hexapeptide-19. Ingredients: Water (Aqua), Glycerin, Acetyl Hexapeptide-8, Acetyl Octapeptide-3, Palmitoyl Tripeptide-28, Dipeptide Diaminobutyroyl Benzylamide Diacetate, Gamma-Aminobutyric Acid, Palmitoyl Tetrapeptide-7, Trifluoroacetyl Tripeptide-2, Palmitoyl Hexapeptide-19, Steareth-20, Dextran, Acrylates/C10-30 Alkyl Acrylate Crosspolymer, Butylene Glycol, Benzoic Acid, Caprylyl Glycol, Disodium EDTA, Chlorphenesin, Sorbic Acid, Aminomethyl Propanol, Phenoxyethanol.